Mark Dow has been a favorite follow of mine on Twitter for a long time. His global macro perspective is directly in line with the way I view the world. We come from very different backgrounds, however. Mark worked for the U.S. Treasury Department and was in charge of Emerging Markets in the early 90s. After that he was a sovereign analyst at a Mutual Fund before running money for a Global Macro Hedge Fund in New York City. Today, Mark runs a Family Office from southern California and recently launched a Private Twitter Account that you can subscribe to called Behavioral Macro. In this conversation, Mark talks about the current environment for stocks, interest rates and the rotation into emerging markets and base metals. He brings a disciplined process and approach to the market that I’ve respected for many years. I really enjoyed this conversation with someone who I consider to be one of the smartest guys in the room. Studying the behavior of market participants is something that we do on a daily basis, whether we recognize it or not. Especially as Technical Analysts who focus on changes in price at very specific levels, understanding the psychology behind why investors are behaving in certain ways is part of that process. Dr. Daniel Crosby is an excellent resource for investors looking to learn more about themselves and investor psychology. In this conversation we discuss the cognitive behavior traits seen on a daily basis from investors with elevated levels of stress due to active positions in the market. Recognizing these flaws is step 1 in our journey to learn more about ourselves so we can be in a position to make the best decisions possible in order to succeed. This is a podcast episode that I have wanted to record for a while now because I think it’s a good breakup from the more traditional market analysis and commentary. I hope this conversations inspires you to take a step back and become more aware of what you’re doing and why you’re doing it. I believe the more self-aware we are, the more efficiently and intelligently we can move forward as market participants. Daniel Crosby, Ph.D. is the Author of The Laws of Wealth and The Behavioral Investor. I encourage you to check them both out! On January 27th, 2018 the 2nd Annual Chart Summit was broadcasting LIVE from the Internet, bringing together an elite group of professional technicians who walked the audience through their process and showed us how to apply their methods in the current market environment. This impressive list of industry experts includes active traders, top Wall St. analysts, wealth managers, swing traders and long-term Investors who each brings a unique perspective on the market. 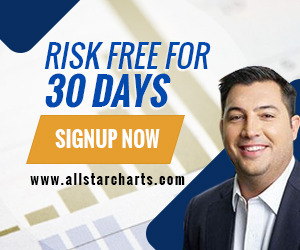 Hosted by the Founder of Allstarcharts.com, JC Parets, Chart Summit was a FREE event and could be viewed online in the comfort of your home from anywhere in the world. The presentations are intended for investors of all kinds: retail investors with short or long-term time horizons, professional investment advisors, traders, fund managers, analysts, professors, and students. This event was the first of its kind and is still fully committed to providing both educational value and actionable market commentary. If you missed this year’s event, you can still watch the videos of the presentations for FREE by clicking here. In this episode, I’m joined by Tom Bruni, a long time friend of Allstarcharts.com and former intern. He brings a unique perspective on markets as he is fresh out of college and finishing the process of earning his CPA, CFA and CMT designations. I couldn’t think of anyone else I would rather have to discuss and review this year’s Chart Summit, the presentations, charts and presenters. This is a special podcast episode dedicated to Chart Summit 2018. Joe Fahmy is a trader whose work I’ve respected for nearly a decade when I was first introduced to him and his investing style. What makes Joe special in my opinion is his awareness of when to press his long positions and be aggressive, while at the same time incorporating a more neutral or defensive approach whenever the market dictates. This discipline is not always easy, but he does it well. Joe and I have known each other for a long time and the conversations we’ve had over meals or drinks is a large part of the inspiration to start this podcast. Joe Fahmy is one of the premier voices for the importance of relative strength analysis throughout an investing process. In this podcast episode we discuss the current U.S. Stock Market environment, sentiment and some select areas where he is currently seeing rotation and strength. This was a great conversations with someone who I consider to be one of the smartest guys in the room! I hope you enjoy. Scott Redler has been trading for almost 20 years. He’s been through the ups and downs in the market on a daily basis and that is something I have a tremendous amount of respect for. Not many people can say this and still be alive and doing better than ever. I’m happy for him and could not be more thrilled to have him as a guest on the podcast. Today Scott is the Chief Strategic Officer at T3 Live where he gets to trade throughout the day as well as share his ideas with the world every single day of the week. In this conversation, Scott walks us through a normal day in his world, what he’s currently seeing in Technology and Energy stocks, where he did well last year and some interesting thoughts on the crypto-currency world. What I loved about this episode is that we have a trader speaking from the heart and letting us into his head so we can all become better and wiser investors. I really enjoyed this and I hope you do as well. JC O’hara is the perfect compliment to all of the amazing guests that we’ve already on the podcast. Because his clients are primarily hedge funds and other buy side institutions, JC brings a unique perspective on market behavior, sentiment and investor psychology. As the Chief Market Technician at FBN Securities, JC gets to speak to some of the smartest investors in the market and we’re lucky to have him sharing his insights and experiences with us in this episode. This week we talk about the current market environment for stocks using breadth indicators, Put/Call Ratios, Investor polls and valuation metrics. I really enjoyed this conversation with someone whose work I have a ton of respect for. I hope you get as much value from this as I did.